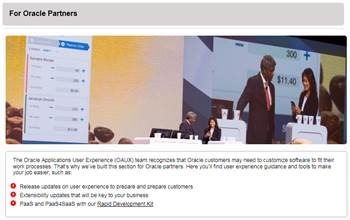 The Oracle Applications User Experience (OAUX) team has loads of new content that we’re eager to share. Beginning with Oracle Voice, Oracle’s platform on Forbes.com, Group Vice President Jeremy Ashley describes in a recent post how Oracle is addressing specific HCM trends and issues in our cloud application services while keeping that “suite” perspective. What else did we write about in the past month? LOOKING TO THE ENTERPRISE FUTURE: The OAUX team reports on wearables and IoT devices as well as Oracle’s investment in the challenges of bringing them to the enterprise in a new post on the Voice of User Experience (VoX) blog. Wearables lie at the center of many IoT discussions, and the possibilities they create when they work in tandem are endless. The OAUX team has been keeping an eye on both areas for several years and is investing heavily in research and development behind the challenges of interweaving the capabilities of both types of devices and bringing them to the enterprise. UX STRATEGY: We know you’re craving the latest in Oracle’s UX strategy, and we must deliver. Learn more in a new VoX post with a bird’s-eye view on our new strategy ebook, or dive right into the (free!) download. NEW TO DO AND SEE: If you’re an Oracle partner, we’ve got some updates just for you. Check the recently refreshed For Partners page featuring Release 10 content. Want to come to one of our partner events? We’ve got you covered on our Events page. Finally, we’re also bringing you a new Cloud User Experience Specialist Role, freshened up for Release 10. Find out more here. Get a tour of the Cloud UX Rapid Development Kit for Release 10 in Overview of the PaaS4SaaS User Experience RDK, including the new Microsoft PowerPoint-based wireframing tools and the software templates and components that are available for developers on OTN and GitHub. In Integrating Google Maps, IFTTT, and OpenWeatherMap APIs into the Oracle Cloud UX Rapid Development Kit , Lancy Silveira writes about APIs used in the Release 10 Cloud UX Rapid Development Kit and how they are integrated into the RDK simplified UI pages, encouraging partners and developers to explore more possibilities that will enrich the Cloud UX for customers in simple, fast ways. Silveira also talks to Customer Connect’s Frank Cowell about the Cloud UX Rapid Development Kit. If you’re a member of Customer Connect, access is easy through the website. HCM Talk Radio, a regular podcast where experts and guests share the latest in HCM Cloud best practices and knowledge, is also available directly. If you haven’t tuned in yet for these informative podcasts, go to Oracle’s Podcast Center or to iTunes and sign up for the feeds to receive and listen to the talk shows regularly.